August was a banner-month for Gil-watches it seems. Early in the month I purchased a 1953 Gilmore thinking it was a Gilbert. Then I got a 1938 Gilman later in the month. And then, finally, I closed out the month with the purchase of my original target - a 1941 Gilbert. The Gilbert was introduced in 1941 just before the start of WWII and reintroduced after the war. It was produced through 1951. It came in a solid 14K yellow gold case with a sterling silver dial and solid 18K gold numerals. Tucked inside is a 19 jewel 982M medallion movement. 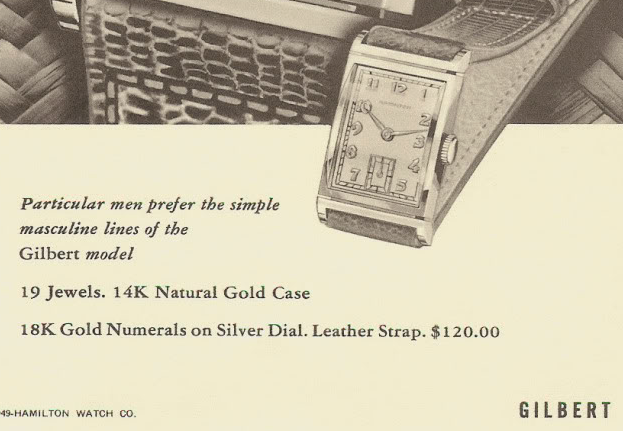 The 982M was the 14/0 sized movement used mainly in post-1940 solid gold models (although some gold filled models got them in 1952 when Hamilton switched over to 12/0 grades). As received, my project watch arrived in decent enough condition but was not running. The Speidel expansion bracelet needed to go - as it's definitely not original. With the bracelet out of the way, I can see one of the lugs is bent inward slightly. I should be able to tweak that carefully back into it's proper place. With the lugs now straightened, you can see the case back is unengraved and looks good. Without the crystal and bezel blocking the view, the dial looks to be rather old. It appears to be original to my eye - at least I don't see any obvious signs of being refinished. This 982M is the older style of the grade with a solid gold medallion inset into the train bridge. It's a little dirty but not too bad - definitely ready for a trip to the spa. Later 982M's lost the medallion and got an engraved circle with a M inside instead. The back of the dial in unremarkable and looks as authentic as the front - so I would say this dial is most likely original to the watch. Everything is thoroughly cleaned and set out to dry before being reassembled. A close look at the balance reveals that the impulse jewel is off to the side. It's at about 4:00 in the photo below. This explains why the watch wasn't running. It should be pointed at about 1:00. So the roller table is either loose or the hairspring collet needs to be turned about 90 degrees. The roller table was definitely loose, as I could rotate it easily with tweezers. I lined it up using a "best guess" and a few gentle taps to a punch on my staking set will properly seat it back in place. The movement is ready to receive the balance assembly - let's hope I lined up the impulse jewel well. A few tweaks to the regulator brings the beat rate in line. Since I've gone this far I might as well try to lower the beat error a little more as well. That means removing the balance assembly again adjusting the hairspring collet so I can change the position of the impulse jewel relative to the pallet fork. Third time is the charm... I'll leave the watch running a smidge fast but the beat error is right where I like to see it. It could be less but anything under than 1ms is beyond fine in my book. With the movement running just as it should, the dial and hands go back on and the assembly is reinstalled into the freshly polished case. A new genuine lizard strap completes the restoration. This watch turned out great. You can probably see why I confused the Gilbert and the Gimore - they are very similar!